The Waffen-SS developed as the military arm of Hitler’s private Nazi army. In 1933 a portion of the Nazi Party’s Schutzstaffel (SS) was armed and trained along military lines and served as an armed force. These troops were originally known as the SS-Verfügungstruppen, the name indicating that they served at the Führer’s pleasure. By 1939, four regiments (Standarten) had been organized. The Verfügungstruppen took part in the occupation of Austria and Czechoslovakia side by side with the Army (Heer). During the months preceding the outbreak of the war, they were given intensive military training and were formed into units that took part in the Polish campaign. In addition, elements of Death’s Head formations (Totenkopfverbände), which served as concentration camp guards, also took to the field as combat units. During the following winter and spring, regiments that had fought in Poland were expanded into brigades and later divisions. This purely military branch of the SS was known at first as the Bewaffnete SS (Armed SS) and later as the Waffen-SS. The regiment Leibstandarte SS Adolf Hitler eventually became a division of the same name; the Standarte Deutschland together with the Austrian Standarte Der Führer formed the Verfügungs Division, to which a third regiment, Langemarck, was later added, creating the division Das Reich; and the Totenkopf units were formed into the Totenkopf Division. These three divisions were to be the nucleus of the Waffen-SS in its subsequent rapid expansion. The Waffen-SS was based on a policy of strict racial selection and emphasis on political indoctrination. The reasons for its formation were as much political as they were an opportunity to acquire the officer material that was to prove valuable to the SS later. As the war intensified, the Waffen-SS began recruiting “Nordic” peoples. 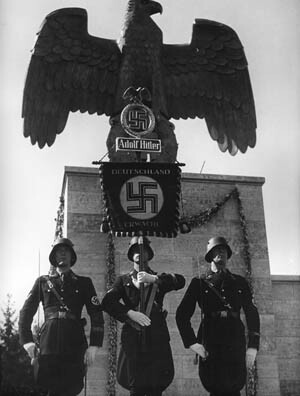 In 1940, the Standarten Nordland and Westland were created to incorporate such “Germanic” volunteers into the organization. They were combined with the existing Standarte Germania to form the Wiking Division. Subsequently, the Waffen-SS formed native “Legions” in many of the occupied territories. These were eventually converted into brigades and divisions. A relaxation of the principles of racial selection occurred as the war turned against Germany. During 1943-1944 the SS turned more and more to recruiting all available manpower in occupied areas. While its main efforts were directed toward the incorporation of the “racial” Germans (Volksdeutsche), a scheme was devised that permitted the recruiting of foreigners of all nationalities while retaining at least some semblance of the original principles of “Nordic” superiority. Spreading foreigners thinly throughout trustworthy units soon proved insufficient to digest the mass of recruits. Consequently, divisions of foreigners were formed that received a sprinkling of regular Waffen-SS cadres. Finally, it became necessary to complement the Waffen-SS officer corps with foreigners. Concerned with the racial aspects of their units, Waffen-SS leaders developed a naming system that dubbed a unit as foreign with an addition to its designation. Units with a high percentage of racial Germans and “Germanic” volunteers—Scandinavians, Dutch, Flemings, Walloons, and Frenchmen—such as the 11th SS-Freiwilligen Panzergrenadier Division Nordland, carried the designation “Freiwilligen.” Units containing a preponderance of non-Germanic personnel, especially Slavic and Baltic peoples, such as the 15th Waffen-Grenadier Division-SS, carried the designation “Waffen-” as part of the unit name. This organizational expansion modified the character of the Waffen-SS as an elite political formation. Nevertheless, these divisions were expected to fight to the bitter end, especially since the individual soldiers had been made to feel personally involved in war crimes, and propaganda convinced most that their treatment, either in captivity or after Germany’s defeat, would compare unfavorably with that accorded other members of the armed forces. Over time, the Waffen-SS created some 42 divisions and three brigades as well as a number of small, independent units. Of the divisions, seven were panzer divisions. The balance included 12 panzergrenadier divisions, six mountain divisions, 11 grenadier divisions, four cavalry divisions, and a police division. Many of the divisions, organized late in the war, were divisions in name only and never exceeded regimental strength. The SS panzer divisions were the purest in terms of German members, as well as being the best equipped and supported of all German combat units. They formed the strongest and politically most reliable portion of the Waffen-SS. The creation of an SS panzer division was sometimes evolutionary. Formed from Hitler’s bodyguard unit, the Leibstandarte SS Adolf Hitler became a full infantry regiment with three battalions, an artillery battalion, and antitank, reconnaissance, and engineer attachments in 1939. 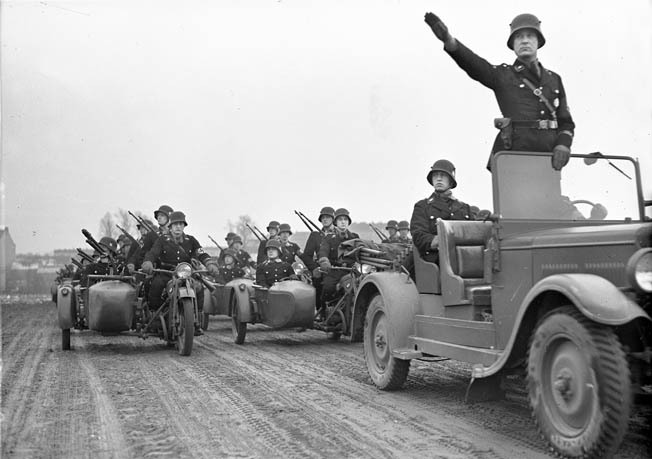 After it was involved in the annexation of Bohemia and Moravia, it was redesignated the Infanterie-Regiment Leibstandarte SS Adolf Hitler (motorized). In mid-1939 Hitler ordered it organized as an SS division, but the Polish crisis put these plans on hold. The regiment proved itself an effective fighting unit during the campaign, though several Army generals had reservations about the high casualties it had sustained in combat. photographed during the Nuremburg Rally in 1935. In early 1940, the regiment was expanded to an independent motorized infantry regiment, and an assault gun battery was added. After the Western campaign, it was expanded to brigade size. Despite this, it retained the designation as a regiment. Following an outstanding performance in Greece, Reichsführer-SS Heinrich Himmler ordered it upgraded to division status. However, there was no time to refit the unit before launching Operation Barbarossa, the invasion of the Soviet Union, and so it remained the size of a reinforced brigade. In late July 1942, severely understrength and completely exhausted from operations in Russia, the unit was pulled out of the line and sent to France to rebuild and join the newly formed SS Panzer Corps, where it was reformed as a panzergrenadier division. Thanks to Himmler and Obergruppenführer (General) Paul Hausser, the SS Panzer Corps commander, the four SS panzergrenadier divisions—Leibstandarte SS Adolf Hitler, Wiking, Das Reich, and Totenkopf—were organized to include a full panzer regiment rather than only a battalion as found in Army units. This meant that the SS panzergrenadier divisions were full-strength panzer divisions in terms of their complement of tanks. Following the capitulation of Italy, the Leibstandarte engaged in several major counterinsurgency operations against Italian partisans. During its time in Italy, the Leibstandarte was reformed as a full panzer division and designated the 1st SS Panzer Division Leibstandarte SS Adolf Hitler. Waffen-SS grenadier or infantry divisions were mainly recruited outside Germany. One was formed from French recruits, two in Latvia, one in Estonia, one with Ukrainians, another from Soviet prisoners, and one of Italian Fascists. The latter two each held the designation as the 29th SS Grenadier Division at different times, the former Soviet prisoners in 1944 and the Italian Fascists in 1945. All of these divisions were created from 1943 to 1945. Ukrainians, Latvians, Estonians, and Russian turncoats who joined the SS were executed if taken prisoner by the Soviets. Those found in the hands of the Western Allies after the war were returned to the Soviets to suffer the same fate. Waffen-SS prisoners taken by the Red Army seldom survived their initial capture or lengthy imprisonment in the Soviet Union. Six SS mountain divisions were formed from Volksdeutsche. Three were short-lived units made up of Balkan Muslims, and one, which never exceeded regimental strength, was formed from Italian Fascists. Eleven of the 12 SS panzergrenadier divisions were created or their designations were assigned from 1943 to 1945. Nine of the divisions were formed from Volksdeutsche and non-Germans, which included Dutch, Walloons, Belgians, and Hungarians, but many were never stronger than regimental strength. Command formations during the war included two SS armies, the Sixth SS Panzer Army and the Eleventh SS Army. Of the 13 SS corps, four were panzer corps, two were mountain corps, and seven were infantry corps. Seven of these corps were not created until 1944. The Sixth SS Panzer Army was created in the autumn of 1944 in northwestern Germany as the Sixth Panzer Army to oversee the refit of panzer divisions shattered during operations in France. It played a key role in the 1944 Ardennes offensive, then in Hungary in 1945, and finally in the fight for the Austrian capital of Vienna. The Eleventh SS Army was formed in February 1945. It operated in northern Germany until the end of the war. One Waffen-SS division was designated the SS-Panzer Grenadier-Polizei Division. This was the only unit made up of members of the police that had been incorporated into the Waffen-SS. In addition, the 35th SS Police Grenadier Division was organized from German policemen in early 1945, although it only reached regimental strength. In principle, the SS was to accept no new members after 1933, except from selected graduates of the Hitler Youth. However, the creation of the Waffen-SS and its rapid growth caused the partial suspension of this rule. However, service in the Waffen-SS did not necessarily include membership in the SS proper. Prior to the war, suitable SS candidates were singled out while still in the Hitler Youth (HJ). Boys who had proved themselves, often under SS leadership, in the HJ patrol service were often tabbed for later SS service. If the candidate satisfied SS requirements in political reliability, racial purity, and physique, he was accepted as a candidate at the age of 18. At the annual Nazi Party Congress in September, candidates were accepted, received SS certificates, and were enrolled in the SS. SS panzer grenadier divisions roll through a soon to be devastated village. Service in the Waffen-SS was officially voluntary. The Waffen-SS claimed priority over all other branches of the armed forces in the selection of recruits. Eventually, to meet the high rate of casualties and the expansion of Waffen-SS field divisions, service in the Waffen-SS became compulsory for all members of the SS, and the voluntary transfer of personnel from any other branch of the armed forces was permitted. From 1943, pressure was exerted on members of the Hitler Youth to volunteer for the Waffen-SS. Later, entire Army, Navy, and Air Force units were taken over by the Waffen-SS, given SS training, and incorporated into field units. Waffen-SS enlistment drives in Germany were nearly continuous. Waffen-SS recruitment was regionally organized and controlled. The decision to enlist “Germanic” and “non-Germanic” foreigners in the Waffen-SS was based more on propaganda value than on the fighting ability of these volunteers. In Scandinavia and the occupied countries of Western Europe, recruiting was undertaken largely by the local Nazi parties. In the Baltic States it was conducted by the German-controlled governments, and in the Balkans by German authorities in concert with the governments. With the growing need for troops, a considerable element of compulsion entered into the recruiting campaigns. The small groups of volunteers were reorganized into regiments and battalions, either to be incorporated into existing Waffen-SS divisions or to form the basis for new divisions and brigades. Early in 1943, the German government, in exchange for promises to deliver certain quantities of war equipment, obtained from the governments of Romania, Hungary, and Slovakia their consent to a major Waffen-SS recruiting drive among the “racial” Germans in those countries. All able-bodied men considered of German origin, including some who could scarcely speak the language, were pressured to volunteer, and many men who were already serving in the armies of these countries were transferred to the Germans. Well over 100,000 men were obtained in this manner and distributed among the Waffen-SS divisions. The results of this recruiting were mixed at best. The 13th SS Mountain Division Handschar may have been the worst unit in the Waffen-SS. Formed in the spring of 1943 as the Bosnian-Herzegovinian Division, it initially consisted of Bosnian Muslims and Croat volunteers. When volunteers lagged, Christian members of the Croatian National Army were forced to join the division. Sent to southern France in mid-1943, the division promptly mutinied. The unit was eventually returned to Yugoslavia. In the Balkans it was involved in massacring defenseless Christian villagers and had a high rate of desertion. In October 1944, the unit was disarmed. In 1945, the 36th SS Grenadier Division Dirlewanger was formed. Better known as the Dirlewanger Brigade, it was upgraded in name to a division in the last weeks of the war. Most of its members were men taken from concentration camps, some were Communists or political prisoners, but most were common criminals. The division eventually accepted hardened career criminals as well as Soviet and Ukrainian prisonerss, members of the Wehrmacht convicted of lesser felony offenses, and eventually all German convicts. Its commander, SS Colonel Oscar Dirlewanger, was a brutal drunkard who had once been expelled from the SS for a morals offense. The brigade was responsible for a number of atrocities, especially against Russian partisans, Poles, and Jews. The division and its commander were considered notoriously unreliable by the German Army. For military operations, units of the Waffen-SS were usually placed under the command of the German Army. In the beginning, individual units were assigned to Army groups as needed, although an effort was made to give them independent tasks whenever possible. Emphasis was placed on the propaganda value of their employment, and many spectacular missions were assigned to them, although their importance and the difficulty of the tasks were often exaggerated. On the Eastern Front, these units became involved in increasingly more difficult combat assignments. Gaining reputations as elite forces, divisions of the Waffen-SS began to control regular Army units in their immediate vicinity. The next step was the formation of SS corps which, under OKH command, controlled SS divisions and brigades. Soon certain SS corps held command over a small group of SS units and a much larger number of Army units. Eventually, certain SS corps commanded Army units only. When the Sixth Panzer Army was formed in the autumn of 1944, a large number of units of the German Army were for the first time designated part of an SS formation. The SS Leibstandarte Adolf Hitler was formed during the 1930s as Hitler’s personal bodyguard and later grew into a division of the Waffen-SS, the military wing of the organization. In this photo from the early days of the Leibstandarte, soldiers pass in review as their commander gives the Nazi salute. In theory, the influence of Himmler ceased with the subordination of Waffen-SS units to the Army. In effect, however, there was evidence that he retained the right to approve any Army deployment of SS troops. The temporary relief of Field Marshal Gerd von Rundstedt as commander on the Western Front in 1944 was attributed, at least in part, to a conflict with Himmler over the deployment of Waffen-SS troops. Waffen-SS units were deployed in all major German land campaigns except North Africa and the 1940 campaign in Norway. Beginning with the conquest of Poland, they played significant roles for the remainder of the war. At least two divisions participated in the Western offensive and Balkan operations of 1940 and 1941. One division was engaged in Finland from the beginning of Operation Barbarossa. In Russia, the number of Waffen-SS units grew from five divisions in 1942 to four corps and 13 divisions during 1944. An SS brigade participated in the garrisoning of Corsica and was later committed as a division in Italy, while another assisted in the occupation of Italy following the Fascist surrender there in 1943. To this were added a new division and a new brigade in 1944. Two Waffen-SS corps and at least seven divisions fought at various times against partisans in Yugoslavia, and one division formed an important component of the occupation forces in Greece. Two Waffen-SS corps and six divisions were employed in Normandy and participated in the withdrawal from France. On the Western Front, one Army, at least six corps, and up to nine divisions opposed Allied forces early in 1945. Nine Waffen-SS divisions and two brigades operated in Hungary near the end of the war. The SS increased its power over the Army dramatically in July 1944, as individual members of the Waffen-SS were attached to regular Army units to improve their reliability. Waffen-SS units were used to prevent mass desertions or unauthorized withdrawals. Waffen-SS personnel formed the nucleus of the Volksgrenadier and in some instances of Volkssturm units. Large contingents of the Luftwaffe and Kriegesmarine were pressed into the service of the Waffen-SS when it became urgent to reform badly mauled Waffen-SS units. At the end of 1940, the Waffen-SS numbered slightly more than 150,000 men. By June 1944, it had grown to 594,000. Intended as an elite force, the Waffen-SS evolved due to the exigencies of war from the original SS concept of a military organization imbued with Nazi ideology and loyalty to Hitler into a polyglot force of decreasing combat effectiveness. Tags Adolf Hitler, Axis, Concentration Camps, Das Reich, Gerd von Rundstedt, Heinrich Himmler, Leibstandarte SS Adolf Hitler (LSSAH), Nazi Germany, Nazi Party, Operation Barbarossa, Schutzstaffel (SS), Totenkopf, Verfügungstruppen, Waffen-SS.